We’d love your help. Let us know what’s wrong with this preview of Undaunted by William Manchee. 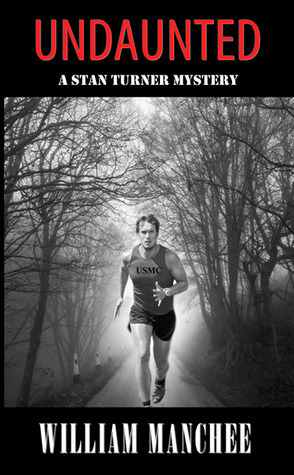 Undaunted is the story of Stan Turner, a law student who enlists in the Marines during the Vietnam War. During basic training, Stan has a confrontation with his drill sergeant. Later on the drill sergeant is murdered. Stan is the prime suspect for the crime. There was an interesting story in this book, but it was bogged down by a lot of details and dialogue. There was a lot of dialogue in this book and at times it was difficult to follow. I did not find Stan very likable and I am not sure if it Undaunted is the story of Stan Turner, a law student who enlists in the Marines during the Vietnam War. During basic training, Stan has a confrontation with his drill sergeant. Later on the drill sergeant is murdered. Stan is the prime suspect for the crime. I did not find Stan very likable and I am not sure if it was because the entire story was told through his eyes. I found that this made the main character a little bit more egotistical than necessary. First person point of view does not usually bother me however, in this book it was a little confusing. For example, chapters 1 and 2 were about Stan Turner and told from Stan Turner’s point of view. Chapter 3 is told from another point of view. The transition was a little rough and left me scratching my head. I could not figure out whose voice it was and I had to read the chapter a few times. Finally, I figured out it was a woman named Virginia, but her character had not yet been introduced. *Book won in a Goodreads First Reads Giveaway. OMG what a great story! It was a page turner. I would like to read all other books by this author. I got two copies of this book as part of a goodreads give away. I thought the premise was very interesting, and I do have to admit, I didn't figure out who the killer was--that was a surprise. I had a hard time getting into the book, largely because it's not terribly well-written. The writing gets better later in the book, but the early chapters are pretty painful. There are a couple of chapters (just two, I think) that are written from the perspective of another character (a reporter), but, jus I got two copies of this book as part of a goodreads give away. I thought the premise was very interesting, and I do have to admit, I didn't figure out who the killer was--that was a surprise. I had a hard time getting into the book, largely because it's not terribly well-written. The writing gets better later in the book, but the early chapters are pretty painful. There are a couple of chapters (just two, I think) that are written from the perspective of another character (a reporter), but, just like the rest of the book, they're written from a first-person POV with no real distinguishing writing, so you basically just have to pay attention to realize those two chapters aren't written from Stan's POV. Stan is an unbelievably good character--in that it's unbelievable he's a person. It's also unbelievable so many women were falling all over him. The characters in general are pretty one-dimensional and so hard to care about. The near death of a major character at the end should have left me feeling shocked or saddened; instead, I felt cheated because there's so little exploration of the emotional ramifications of the event for the characters involved. I just won this selection through the First Reads giveaway here on Goodreads and I'm patiently and excitedly awaiting its arrival. I love to read any books related to psychopaths or serial killers since it's what I study! So I'm very disappointed with this selection. I know it's a first in a series so I'll be gentle. This reading was laughable at best. This Stan Turner character was certainly likable but he's impossibly fake. There is NO man like this out there. He claims to be in lov I just won this selection through the First Reads giveaway here on Goodreads and I'm patiently and excitedly awaiting its arrival. I love to read any books related to psychopaths or serial killers since it's what I study! This reading was laughable at best. This Stan Turner character was certainly likable but he's impossibly fake. There is NO man like this out there. He claims to be in love with his wife... then he has these gorgeous women throwing themselves at him (literally) more than once and he turns them down even though he's somehow managed to fall in love with one of them. Yet, nothing happens due to his devotion to his wife. LAUGHABLE! He's accused of a crime and it was definitely not an obvious criminal (which is why it got 2 stars rather than one) but then after the case gets solved, Stan gets accused of something else... somehow that's wrapped up in a chapter but not before something else happens. It's just silly. The story was okay and I would have given the book three stars except the edition I read had so many typos it was distracting. It was if someone type the story on a typewriter and failed to have it proofed before being published. Don’t you just love it when a book has had its copyright renewed 3 times, the latest being in 2013, and there’s a grammar mistake in the 2nd paragraph of the first page? And it doesn’t stop there! You can hardly go more than two pages without an obvious editing error – grammar, punctuation, incorrect word choice, missing words, uncorrected changes from first person POV to 3rd person POV, et cetera and so on. I realize that this is either the first or second book that the author ever had published Don’t you just love it when a book has had its copyright renewed 3 times, the latest being in 2013, and there’s a grammar mistake in the 2nd paragraph of the first page? And it doesn’t stop there! You can hardly go more than two pages without an obvious editing error – grammar, punctuation, incorrect word choice, missing words, uncorrected changes from first person POV to 3rd person POV, et cetera and so on. I realize that this is either the first or second book that the author ever had published (original copyright is 1997). I also realize that this is the first book in a series that, to date, has at least 10 books. But the first book in a series is like the flagship of a fleet. It needs to be good; actually, it needs to be better than good if the author is to entice readers to buy a second and future novels. And this book wasn’t good. It had an excellent premise, but that premise got lost in a myriad of errors and faulty constructs. And, apparently, the author has never seen fit to give his flagship an overhaul. First, the main protagonist, Stanley Turner, is portrayed as just about the most oblivious, naïve, wishy-washy late 1960’s college-age male facing the Vietnam War draft that I have ever seen (or read about). You see, I am only a year younger than Stanley was portrayed as being. And even though I am female and was not subject to the draft in those years, every guy I knew in college was. Every last one of those guys knew every option in every military branch open to them on a daily basis. And yet Stanley was written as the ostrich with his head in the sand, not knowing his options, not even checking them out until it was too late, just hoping the war would end before he graduated. The word “unrealistic” doesn’t even begin to describe this set-up. Secondly, there was the section of the book concerning the court-martial proceedings. Even in 1970, hearsay evidence was not allowed, evidence had to be documented, presumptions were squashed and court-martials were not public. The author’s lack of research in this area is appalling. And these are just the most obvious of the poor constructs. There are simply too many, large and small in scope, to describe in this review. However, there was one redeeming value to this book. The author may have portrayed Stan as naïve and wishy-washy, but Stan was also consistently portrayed as an honorable and good man, a man who loved his wife and family, a man with a conscience and the guts to follow that conscience. In reality, it took over half the book to get to the action, the murder mystery. That first half slogged through an overload of background and biographical material on Stan. It also contained material on other characters and situations without relating that material to our protagonist. And the author failed to establish a creditable timeline in relation to these scenarios. Normally, I would have abandoned a book with such a plethora of problems well before that halfway mark. However, I won the 5th book in the series, Deadly Distractions, in the Goodreads Giveaway Program. I knew that I wouldn’t be able to give that book an honest review without at least reading the first book in the series. So I purchased this book to try to get a feel for the main character and the basis for the series. And I fought with it to the last page. I surely hope that 5th book is better. This is the first Stan Turner mystery. William Manchee is a master at weaving a multi-plot novel filled with plenty of suspense. He adds plenty of courtroom drama made extremely believable due to his years of experience with the legal system (as a lawyer of course). Stan is just starting to reach for his dreams of becoming first a lawyer and then a politician. He is also starting his life with his wife and his first child. But with the Vietnam War raging, he is worried about the draft. Just when h This is the first Stan Turner mystery. Stan is just starting to reach for his dreams of becoming first a lawyer and then a politician. He is also starting his life with his wife and his first child. But with the Vietnam War raging, he is worried about the draft. Just when he thinks he is in the clear, he gets notice he has been drafted. Thinking it will be better to enlist and becoming an officer, Stan joins the Marine Corp and heads for OCS. Suddenly Stan's luck gets even worse. He gets in trouble with his drill sergeant on his very first day. Stan ends up in the hospital and his drill sergeant ends up murdered. Stan is on a path that will bring him into contact with a serial killer, overly-friendly woman , and a trial that could end up with him in front of a firing squad. With just crumbs of leads and a few helpful strangers, Stan is faced with hurdle after hurdle. Even the smallest stumble could mean the end of Stan's marriage, freedom, or even his life. My only quibble with the book is that printer gremlins did cause several glitches (such as changing the pronoun from he to I or his to my). I did not realize Stan was quite this old. From this book, Stan would be in his mid-sixties in his latest story. He seemed to be younger. Undaunted is a huge disappointment. What should have been a great story line ends up being trampled to death in the race to the finish. Characters are flat and poorly developed, with wildly varying traits occurring in the same people at different times in the book. Unless the author somehow forgot to mention that more than half the cast is suffering from bipolar disorder, the characters were unrealistic and often irritating. The writing itself is frustrating to read because there were, at least i Undaunted is a huge disappointment. What should have been a great story line ends up being trampled to death in the race to the finish. Characters are flat and poorly developed, with wildly varying traits occurring in the same people at different times in the book. Unless the author somehow forgot to mention that more than half the cast is suffering from bipolar disorder, the characters were unrealistic and often irritating. The writing itself is frustrating to read because there were, at least in the edition that I read, glaring typographical errors. In some cases, entire words were wrong, like the word "innocent" appearing where it clearly should have said "incident." There were also several times where half of a sentence was written in third person, and the other half was in first. On top of all that, there were several incorrect statements of law and/or legal procedure, which indicate that the author did not research those areas thoroughly. I won Undaunted through the Goodreads First Reads Giveaway on 12/02/2010 and received my copy on 12/13/2010. I just finished reading Undaunted and I feel like something was taken from me in a way. I was so excited to read this book and through the whole thing, the book felt a bit robotic. Like someone just had a ton of ideas for the book and jotted them down. I hate to say that, but it's my honest opinion. Undaunted also skipped around. It will be one month in the book and then the next paragraph I won Undaunted through the Goodreads First Reads Giveaway on 12/02/2010 and received my copy on 12/13/2010. Undaunted also skipped around. It will be one month in the book and then the next paragraph it will be 3 months later. But in the middle of all of that, there will be a sentence that goes back to something that happened 5 months ago and weighs no bearing on the situation at hand, it just felt like random unnecessary facts. There were also so many characters that showed up for a sentence or two and then they came back later - I always had to flip back through the book and try to find their name so that I knew what in the world was going on in the story. This is the first of the Stan Turner mysteries created by William Manchee. This book starts out with Stan joining the Marines so he can avoid being drafted. This takes place in 1970 when our country was still fighting in the Vietnam War. Stan goes to boot camp and things go downhill from for Stan. His drill sergeant is not a warm and guy. Stan gets beat with a plastic rod and ends up in the infirmary. Then the drill sergeant is killed. Stan is the prime suspect. How does he find the true killer? This is the first of the Stan Turner mysteries created by William Manchee. This book starts out with Stan joining the Marines so he can avoid being drafted. This takes place in 1970 when our country was still fighting in the Vietnam War. Stan goes to boot camp and things go downhill from for Stan. His drill sergeant is not a warm and guy. Stan gets beat with a plastic rod and ends up in the infirmary. Then the drill sergeant is killed. Stan is the prime suspect. How does he find the true killer? It was a fun read. Stan has trouble being friends with women. He is married to Rebekah and stays loyal to her but he sure puts himself in situations that aren't advisable for married men with Rita and massage therapist Nicole. These women help him but come on Stan, what were you thinking. I had read the second book in the author's other series and loved it so much I did go out and buy the other two books and they were just as good. This book is mainly about Stan Turner and his life, growing up, in high school, college and then married and then his military life. I recall the draft lottery as my brother had #134 as we sat huddled near the radio that day as the #'s were being announced. Liked following the military career and found it to be similar to what my son told us about when he was in the army boot camp. Hard at times to hear of the abuse and dying senselessly. Court trial was a bit different than the regular ones in the public sector. Liked how the action was there all the time and you had to pay attention to the clues as they came out later in the trial..
Not a typical book I would've picked to read but I really did enjoy the story line and characters, and a bit of travel and learning about the Marines. This is the first book that I read by William Manchee. I was initially curious about this book because of the picture on the cover, I wasn't sure what to expect from this mystery. In the long run,this was a good read and I found myself excited as to what would happen next in the story. I must admit that at first I was a little confused in the first chapters. I thought it was a short short story book and that one story had finished and another beginning, when in reality the story teller was going from past to present. In any case, I think it may have just been my needing to get accustomed to the author's style of writing. I quite liked the story line and suspense. The book was long and a little bit drawn out, but generally I enjoyed the book and anticipate reading more books by William Manchee. This was a an interesting story premise, but the writing was just not up to par. It was very raw and unfinished, and not in a good way. The whole beginning was very unsophisticated and, in my opinon, completely unnecessary. It was an information dump, I guess because the author didn't know any way else to get the info out there. It would have been much better had he let it come out via the character's thoughts or actions or even just waiting until it came up later in the book, which it did. The book must have started as a first person POV, then changed to a third person POV, because there were numerous instances of "I did this" instead of "He did this." Grammatical errors abounded. I won Undaunted by William Manchee from Goodreads and I found it an enjoyable book. It follows Stan Turner and every man type character that grew up in California during the 50’s. Turner is married and in law school; to avoid the Army draft he joins the Marine Corps and heads to Officer Candidate School. While there his drill sergeant is murdered and his finger prints are on the murder weapon. Charged with murder Stan has to find the real killer with the help of a nurse who has the hots for him I won Undaunted by William Manchee from Goodreads and I found it an enjoyable book. It follows Stan Turner and every man type character that grew up in California during the 50’s. Turner is married and in law school; to avoid the Army draft he joins the Marine Corps and heads to Officer Candidate School. While there his drill sergeant is murdered and his finger prints are on the murder weapon. Charged with murder Stan has to find the real killer with the help of a nurse who has the hots for him and a journalist trying to get a story. I think most people will enjoy this book and there are two more Stan Turner novels by Manchee out if you like this one. It is an entertaining mystery legal thriller and worth a look if you like the genre. I won this book through First Reads. I enjoyed the plot of this book and found it to be a quick read. My issues with the book are that while the narration portions of the book were well written, the conversational portions of the book came across as unrealistic. Something about the wording came across as not how real conversation sounds. I also had difficulty with the point of view changes in the early chapters as it was unclear whose point of view we had switched to and why. Obviously, later in I won this book through First Reads. I enjoyed the plot of this book and found it to be a quick read. My issues with the book are that while the narration portions of the book were well written, the conversational portions of the book came across as unrealistic. Something about the wording came across as not how real conversation sounds. I also had difficulty with the point of view changes in the early chapters as it was unclear whose point of view we had switched to and why. Obviously, later into the book it all makes sense. Ok. This was an average read for me. I was loaned the book by a friend who won a copy in the Goodreads First Reads Giveaway. There was nothing wrong with the story and I was able to finish reading the book from cover to cover but it never really grabbed me. I was happy enough reading it but I was never truly drawn in. Nothing was wrong with the characters, but nothing stood out about them either. The dialogue was my main gripe though as at times it felt really stilted to me and I didn't believe it. Ok. This was an average read for me. I was loaned the book by a friend who won a copy in the Goodreads First Reads Giveaway. The dialogue was my main gripe though as at times it felt really stilted to me and I didn't believe it. Recommends it for: Anyone who likes a military mystery. Recommended to Pat by: I was a Goodreads giveaway. I won this book through a Goodreads giveaway - thank you. I found the title of the book "Undaunted" to be an appropriate name. I won a copy of this book a few years ago, I have reread it recently and thought that I ought to give an honest review. The story itself is an interesting one, I feel that a series of books would be great and I would read more in this series. There are a lot of ideas to explore with regards to the main characters back story and "future" story. But I couldn't get past the poor spelling and grammar (hence the low stars). I kept noticing such obvious mistakes that I found myself wanting to underline I won a copy of this book a few years ago, I have reread it recently and thought that I ought to give an honest review. I enjoyed the drama that unfolds in this well written story. After finishing this book I recommended it to a neighbor and she is now reading it. I love to share good books! I won a this copy of "Undaunted" from Goodreads! Many thanks to Willilam Manchee for offering this in a giveaway, and thank you Goodreads for choosing me as a winner. This is a such a wonderful place to learn about new books, discover authors, share ideas with readers and wrtiers...the list goes on and on. While I rather enjoyed the book, I did find it was slow getting started. The character development was a little to in depth during the first few chapters, and the story didn't even begin until half way through the book. Even when it did start it picked up very slowly. On the good side, when it did gain some momentum there were some wonderful plot twists that catch you completely by surprise. By the last few chapters I found the book hard to put down. I won a free copy of this book. It was a good story but I found the writing a little stilted. between a friendly kiss and a romantic kiss. Sorry that I can give it only three stars. Undaunted by William Manchee is the first book in the Stan Turner Mysteries. It is a very well written, very quick read. I enjoyed it tremendously. Mostly, in detective/mystery series, the reader picks up the characters at some life point, then flashes show you what led to those events. Undaunted tells the story of Stan Turner from the very beginning, almost biographically. It is amazingly well done. This was an OK read but bless this Marine Hero! He had so many things go wrong and it seemed he was the only one to be able to fix the issues. I am aware that both Marines and Heros are the best to call when there is trouble but this poor guy was overworked, and should have just locked his door and stayed in bed. Book 1 in the Stan Turner Mystery series. Mystery/Legal Thriller. I've read a few books from this series and really enjoyed them, so I decided to make it my goal to read them all. Undaunted is a fun read with great characters, courtroom drama, suspense, humor, and a few surprises. Nothing ever works out easily for Stan. Another book for my favorites shelf. This was a fast read. I was distressed by the grammatical errors, the mixing of first and third person in the narrative, run on sentences, etc. WHY were these not corrected in the years between publications??? Storyline was initially slow moving and the main characters needed to be fleshed out . The beginning writing was quite awful, and I almost stopped reading altogether. Eventually I finished and found the premise in general as interesting, but I didn't quite enjoy it.